Blueberry Vegan Cheesecake may look difficult to make, but I assure you they take less than an hour. I would just leave it out and add another flavor base, such as strawberries or raspberries. I used my muffin tin and it perfectly fit for little mini cheesecakes. Basically everything I would have used to make a healthy, vegan and gluten free. I love that this cheesecake is mini, because mini things are just cuter. If you’re not a blueberry person, blend in your berry of choice. 1. First Soak Cashew nuts in hot water for 1-2 hours for filling and keep aside. 2. Soak pitted dates for 15 minutes in warm water and keep aside. 1. Add almonds into a food processer and blend it coarsely, then add soaked and drained dates into the food processer, add oats, salt and blend it again till thick coarse mixture. 2. Now take a muffin pan, place the plastic wrap or parchment paper into the muffin cups. 3. Take spoonful of crust mixture, press into the muffin cups and fill the cup ¼ level. Use your finger tips for pressing the mixture, apply little oil, so it won’t stick to your fingers. 4. Now place the muffin pan into a freezer to set crust, till filling is ready. 1. Drain the soaked cashew nuts, add into the food processer bowl, add milk, coconut oil, vanilla extract, lemon zest, maple syrup and blend it till smooth paste. 2. Take the prepared crusty muffin pan and pour the filling cashew mixture over the crust and fill the cup ¾ level. 3. Place the pan again into the freezer till topping is ready. 1. Add fresh blueberry (if frozen then before use thawed it), lemon juice, maple syrup and cook it on medium flame. Once blueberry pop up, break it with spatula and cook it till thick mixture (like a jam). 2. Remove it from flame, once cooled down, blend it into the blender and make thick sauce. 3. Now pour the topping sauce over the cashew layer and fill the muffin cup completely. 4. Place the filled muffin pan into the freezer for 4-5 hours. 5. 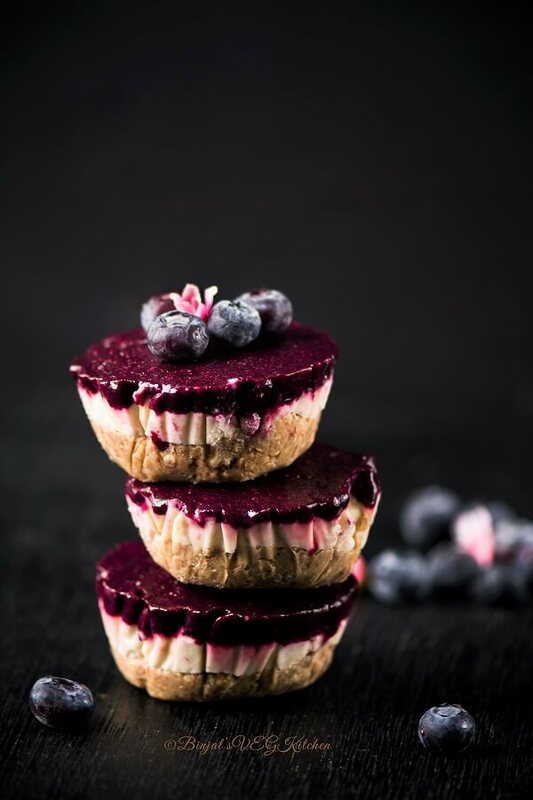 Blueberry vegan cheesecake is ready, remove it from the muffin pan, remove the wrap/paper, keep aside for 3-4 minutes and then serve it cold. • You can use any berry like strawberry, cranberry, raspberry, etc.…for topping. • You can skip maple syrup, if you don’t like it. • You can use walnuts instead of almonds for crust. Blueberry Vegan Cheesecake is perfect dessert to treat your love ones with healthy way. This no bake Blueberry Vegan Cheesecake has no egg, no dairy product, no sugar, no flour, vegan, gluten free and paleo too, but still taste delicious. First Soak Cashew nuts in hot water for 1-2 hours for filling and keep aside. Soak pitted dates for 15 minutes in warm water and keep aside. Add almonds into a food processer and blend it coarsely, then add soaked and drained dates into the food processer, add oats, salt and blend it again till thick coarse mixture. Now take a muffin pan, place the plastic wrap or parchment paper into the muffin cups. Take spoonful of crust mixture, press into the muffin cups and fill the cup ¼ level. Use your finger tips for pressing the mixture, apply little oil, so it won’t stick to your fingers. Now place the muffin pan into a freezer to set crust, till filling is ready. Drain the soaked cashew nuts, add into the food processer bowl, add milk, coconut oil, vanilla extract, lemon zest, maple syrup and blend it till smooth paste. Take the prepared crusty muffin pan and pour the filling cashew mixture over the crust and fill the cup ¾ level. Place the pan again into the freezer till topping is ready. Add fresh blueberry (if frozen then before use thawed it), lemon juice, maple syrup and cook it on medium flame. Once blueberry pop up, break it with spatula and cook it till thick mixture (like a jam). Remove it from flame, once cooled down, blend it into the blender and make thick sauce. Now pour the topping sauce over the cashew layer and fill the muffin cup completely. Place the filled muffin pan into the freezer for 4-5 hours. Blueberry vegan cheesecake is ready, remove it from the muffin pan, remove the wrap/paper, keep aside for 3-4 minutes and then serve it cold. This looks so yummy! I love your photos and recipes! You do a wonderful job. Wow… so much of goodness in there!!! Beautiful shots as always 🙂 Looks gorgeous. Have a great weekend.